2018-09-14 Could explosions and fires in Massachusetts involve smeters?? 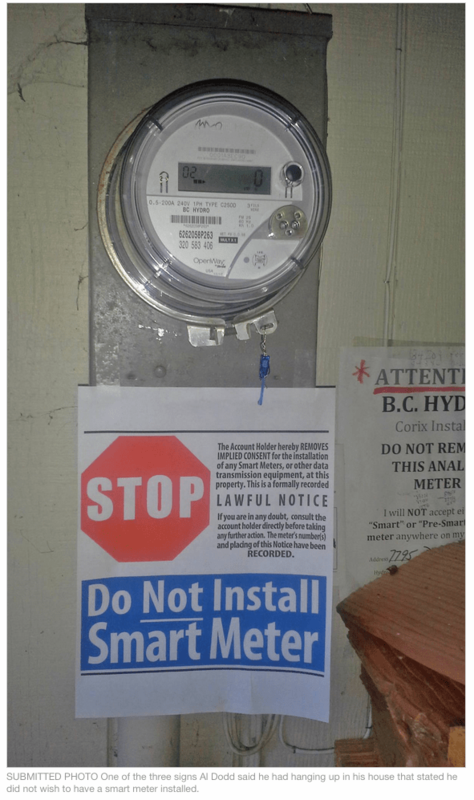 1) Recently, BC Hydro is hard at removing analogs everywhere, even entering a garage while the owner is gone. 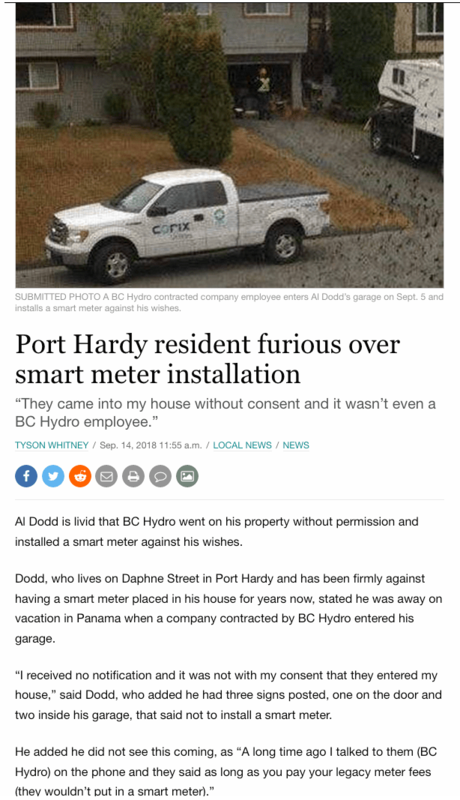 Look at the “alternate facts” Olynyk says to explain it – “Measurement Canada” is requiring it and will fine BC Hydro. This company keeps pushing its twisted agenda – and we must demand a review by the Auditor General. 2) On Devra Davis’s website, there is a link to excellent info about 5G, including links to many studies that support strong statements. 3) A couple of days ago in Massachusetts, many homes in 3 separate communities caught fire and exploded. If, as suspected, leaking gas was the cause, imagine how sparks from smeters might have contributed. I asked Cece Doucette, who lives in Mass. and has been a leader in the fight against microwave radiation, if there were any questions about smeters being involved and she said not so far, but the investigation is ongoing. I couldn’t find any newer info than that in the articles below. Cece asked if I would encourage our members to write to the authors of the article, not just comments in the article itself, telling them about the smeters being fire hazards and asking if anyone has looked into the possibility that they contributed to the horror. To send an email, click on the “envelope” above the first video at the top of the article. LAWRENCE, Mass. — Violent explosions and billowing fires tore through three towns north of Boston late Thursday afternoon, damaging dozens of houses, forcing thousands of stunned residents to evacuate and plunging much of the region into an eerie darkness. One person was killed and more than 20 were injured in the sudden string of explosions caused by gas leaks in Lawrence, Andover and North Andover as blackish-gray clouds of smoke rolled across rooftops and flames shot into the sky. Leonel Rondon, 18, was killed while he sat in a car in the driveway of a home in Lawrence, the authorities said. A chimney fell onto the car, they said, when the home, on Chickering Road, exploded. Across the region, residents returned from work to find their homes burning and neighbors standing outside with no clear sense of what to do. Firefighters and other emergency workers raced from block to block, urging residents to evacuate to shelters that were hastily being opened. Along some blocks, the smell of gas hung in the air, and cellphones buzzed with evacuation warnings. The string of explosions, fires and reports of gas odor — at least 70 of them, although officials were still trying to account for all of the damage late Thursday — came suddenly, beginning shortly before 5 p.m., without warning and without an immediate explanation from officials. But natural gas, and the possibility that gas had become overpressurized in a main, was the focus of many local authorities. Earlier in the day, a local gas company, Columbia Gas of Massachusetts, had announced that it was “upgrading natural gas lines in neighborhoods across the state.” On Friday morning, the company said in a statement that workers would need to visit each of the 8,600 affected customers to inspect the gas meter. “We expect this will be an extended restoration effort,” the statement said. With three communities that are home to more than 100,000 people involved, the aftermath was chaotic, confusing and shifting by the minute. In some neighborhoods, firefighters found themselves putting out one fire, only to find another breaking out next door or down the block. Images from Lawrence showed several housing complexes bursting with flames and thick smoke billowing as firefighters rushed to the scenes. Annie Wilson, 73, was home alone in her third-floor apartment in south Lawrence when she smelled smoke. She opened her back door and smoke poured into the house. She ran out the front, and her parakeets flew away as she tried to rescue them. Fire quickly consumed the building. Ms. Wilson said she lost everything, including her husband’s ashes, which were in an urn, all her family photographs and all her clothes. In the long hours after the fires, sections of the communities turned dark and silent, with power turned off and people told to leave. More than 18,000 customers were without electricity at one point on Thursday night. Long lines of traffic jammed the roads out of some towns. Traffic was crammed, too, near roads to shelters that were opened to those left homeless. Some exits off the major interstate highways were closed, and officials said the area’s schools would be shuttered on Friday. Thousands of people were left to sort out what to do. Some people said they were told to leave only if they smelled gas; others said they were told to leave regardless. Residents said they were uncertain whether to stay or go, and when they might return. “What we need folks to do is that if it’s happening in your home, you have a funny smell, just evacuate, come out to the street,” Mayor Dan Rivera of Lawrence told WBZ-TV. The worst part, said Maria Santana, who was at home in Lawrence when she smelled gas, was that the explosions came without warning and that no one in authority seemed to have any idea of what was happening. A school not far from her home that her children and grandchildren had attended was damaged, she said. was the focus of many local authorities on Thursday evening. Maureen Taylor, 55, had been putting a roast in the oven at her Andover home when something seemed strange: The gas stove made the usual clicking noises, but it would not light. A minute or so later, her phone buzzed with an alarm telling her to evacuate. “I’m very lucky that the stove didn’t go off,” she said. On her way to a senior center for shelter, Ms. Taylor saw two homes in her neighborhood burning. Officers were gathered on the streets. At the senior center, Ms. Taylor said she was surrounded by dozens of other people who wondered what would come next. As the night wore on, leaders of the three towns suggested that residents who had been evacuated needed to stay away — at least for now. No timeline for cleanup and safety checks was set, they said, and no one had a real sense of how much damage had been done. Mr. Rivera said the affected properties in Lawrence were south of the Merrimack River. He warned people not to return to their homes on Thursday evening, and that it may take days to ensure that homes are safe to enter. Gov. Charlie Baker said public safety officers and government officials are focused on trying to make sure that people are safe and that communities make it through the night safely, despite the loss of power and lingering fears over gas. Later, he said, he will turn his attention to what caused the explosion. “We’ll get to the question about what happened,” he said. Katharine Q. Seelye reported from Lawrence, Mass. ; Farah Stockman from Cambridge, Mass. ; Jacey Fortin from New York; and Monica Davey from Chicago. Andrew R. Chow and Julia Jacobs contributed reporting from New York. The opposite of courage in our society is not cowardice — it is conformity.